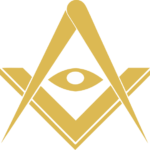 Upon researching the history of Freemasonry all historians and commentators agree that modern Freemasonry has it's immediate history in the master Mason builders of the great European Gothic Cathedrals of the Middle Ages. These builders were themselves closely tied to the Knights Templar and to the Templar building associations, heirs to the Central European monastic associations and the Byzantine Colleges which, in turn, had their origins in the Roman Collegia. Via this chain, Freemasonry can be said to date back to the 6th century B.C. This traditional uninterrupted chain leads us back to the important Initiatic Schools of Egypt in which certain adherents had attained the highest degree of initiation. Moses, Pythagoras and Plato are believed to be among these high initiates. Each Collegia had a communal home where the artisans met on certain days, united in a feeling of pious solidarity, to share meals. Undoubtedly, the religious aspect was presided over by a Master of the "College". Members of the college transmitted, and jealously guarded, the secrets of building construction, and their high reputation as builders made them sought after by the nobility. After the fall of Rome, there were numerous upheavals in the social order and what was left of the Collegia integrated with the masonic orders, which were then multiplying in the Christian world. The thick walls of these institutions offered a secure refuge to maintain the torch for the arts and sciences and allowed the builders to escape from constraint and move about freely. So they constructed the churches and convents of the era (6th and 7th Centuries A.D.). Little by little, throughout history, the growing peace of material security and the immigration of artisans enabled the Brotherhoods of Master Builders to regroup. The Masonic bond with the Order of the Temple, both initiatory and as keepers of the principle traditions, is undeniable. Upon the dissolution of the Knights Templar at the hands of the Inquisition, several of its members took refuge in European countries where the order still existed or in the lodges of the Masonic builders. Those who had found refuge in Scotland consequently founded Scottish Freemasonry. To the ancient builders, all of life's acts were intermingled with religious meaning. The work had a sacred character because it symbolized the creation of beings and things by the Divine. So the builders worked on the sites, in lodges, where only the people of the profession were admitted and the secrets of construction were transmitted from Master to student. The products of their endeavors, the imposing cathedrals, were and still are the true Esoteric Books of Wisdom where the Masters of that age wrote down the inherited knowledge of the Mysteries of Antiquity, in symbol and form just as in ancient Egyptian architecture. The ancient builders, however, were not just builders or stone cutters. During the construction of these monuments, members met to work upon metaphysical research and philosophical teachings. The end of the great operative period of construction marked the beginning of that which we now call speculative where the philosophical aspect of the initiatory work has continued to the present time. Modern Freemasonry aims to build the interior Temple that is the core self of every individual. To do this, symbols are put at the disposition of the adherent, to allow each, by their own study, to create the necessary relationship for their own spiritual growth. Freemasonry is an authentic initiatory society because it transmits a true initiation and conveys through its rituals and symbols, the teaching of the ancient Mystery Schools of which it is a trustee and heir. Initiation confers a particular spiritual influence, actualized by the rites, whose effectiveness greatly surpasses the interpretation that is given and which finds its vastness in the legitimacy of its affiliation. All authentic Initiatic steps aim at awakening the adherent. The best possible instruction alone cannot give Knowledge of the "Mysteries" because spiritual awakening cannot be provoked except by a systematic introspection which must be supported by the knowledge of deep seated psychic mechanisms. The objective of Initiation is to guide the individual towards this Knowledge by an interior Illumination. The initiatic method of Egyptian Freemasonry is essentially an inner intuitive path and this is why Freemasonry uses symbols to provoke this enlightenment as these symbols speak the language of the subconscious. The Rite of Memphis-Misraim is a Masonic rite which was formed by the merging of the two rites of Memphis and Misraïm under the influence of General Garibaldi in 1881. From as early as 1738, one can find traces of this Rite filled with alchemical, occult and Egyptian references, with a structure of 90 degrees. Joseph Balsamo, called Cagliostro, a key character of his time, gave the Rite the impulse necessary for its development. Very close to the Grand Master of the Order of the Knights of Malta, Manuel Pinto de Fonseca, Cagliostro founded the Rite of High Egyptian Masonry in 1784. Between 1767 and 1775 he received the Arcana Arcanorum, which is three very high hermetic degrees, from Sir Knight Luigi d’Aquino, the brother of the national Grand Master of Neapolitan Masonry. In 1788, he introduced them into the Rite of Misraïm and gave a patent to this Rite. It developed quickly in Milan, Genoa and Naples. In 1803, it was introduced by Joseph, Michel and Marc Bedaridde. It was forbidden in 1817, following the incident of the Four Sergeants of La Rochelle and the uneasiness caused by the Carbonari. The Rite of Memphis was constituted by Jacques Etienne Marconis de Nègre in 1838, as a variant of the Rite of Misraïm, combining elements from Templarism and chivalry with Egyptian and alchemical mythology. It had at least two lodges (“Osiris” and “Des Philadelphes”) at Paris, two more (“La Bienveillance” and “De Heliopolis”) in Brussels, and a number of English supporters. The Rite gained a certain success among military Lodges. It took on a political dimension and in 1841 it became dormant, probably because of the repression following the armed uprising of Louis Blanqui’s Société des Saisons in 1839. With the overthrow of Louis-Philippe in 1848, the Order was revived on March 5, with its most prominent member being Louis Blanc, a socialist member of the provisional government with responsibility for the National Workshops. In 1850 Les Sectateurs de Ménès was founded in London which proved popular with refugees fleeing France for London at that time. About ten lodges were set up by French refugees, the most important being La Grande Loge des Philadelphes chartered in London on January 31, 1851, which continued to exist until the late 1870s. During this time it had about 100 members, often called Philadelphes. Between 1853 and 1856 other lodges of the Rite of Memphis were established. In 1856, Benoît Desquesnes, the exiled secretary of the Société des Ouvriers Typographes de Nord proposed that the higher degrees of the Rite of Memphis were not only superfluous, but undemocratic and inconsistent with the Masonic ideals of equality. Despite the attempts of Jean Philibert Berjeau to dissolve the Philadelphes, they implemented this proposal and elected Edouard Benoît as master. This group became renowned for their involvement in revolutionary politics. However the Gymnosophists and the L'Avenir lodges remained with Berjeau. In 1860 the number of degrees was reduced to 33, and by 1866 Berjeau dissolved them, most of the Gymnosophists joining the Philadelphes. In 1881, General Giuseppe Garibaldi prepared to fuse the two Rites, which would be effective as of 1889. Its popularization was greatly increased owing to the works of English Masonic scholar Theodore Reuss, the agent of John Yarker, who became Deputy Grand Master in 1902 and Grand Master in 1905. He was succeeded in this office by noted occultist Theodor Reuss in 1913. At the "International Masonic Conference" in Paris on June 24, 1908 Theodore Reuss elevated Gérard Anaclet Vincent Encausse (Papus) as X° of the Ordo Templi Orientis as well as giving him license to establish a "Supreme Grand Council General of the Unified Rites of Ancient and Primitive Masonry for the Grand Orient of France and its Dependencies at Paris." When John Yarker died in 1913, Gérard Anaclet Vincent Encausse was elected as his successor to the office of Grand Hierophant (international head) of the Antient and Primitive Rites of Memphis-Misraim.